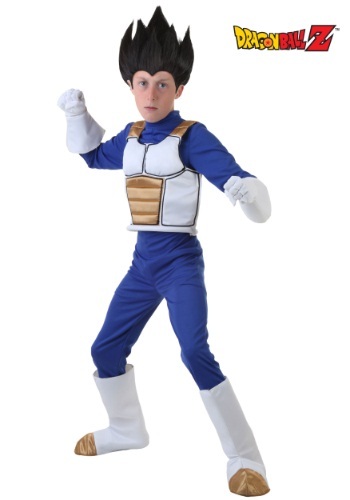 Dragon Ball Z Child Vegeta Costume By: Fun Costumes for the 2015 Costume season. Having a scientist as a girlfriend has its perks. Just ask Vegeta. Bulma took his old Saiyan Battle Armor and revamped it for him. Not only does it make him look tougher, but it's completely ready for a training session in the hyperbolic time chamber and it provides ease of movement for performing powerful super moves like the Galick Gun, or the Big Bang Attack. Since your kid probably doesn't quite have a girlfriend like Bulma just yet, we can give you a hand with this Dragon Ball Z outfit. It recreates Vegeta's signature look during the Androids Saga.